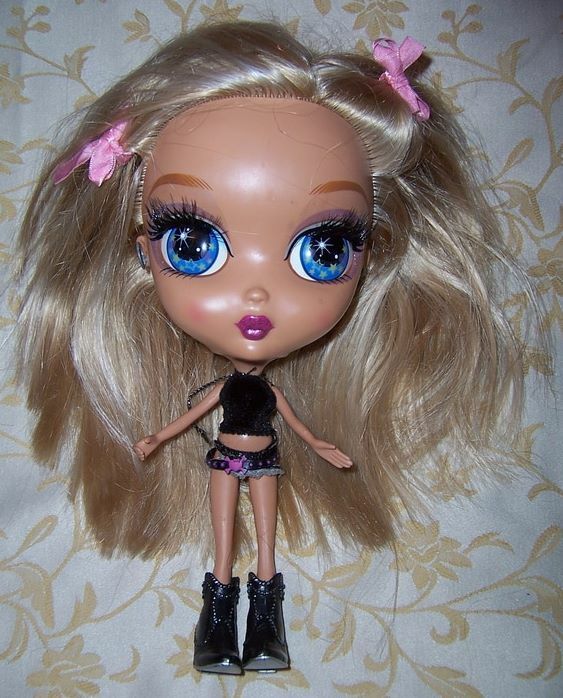 Beauty Cutie dolls were produced by Mattel in 2006. They were fashion statement dolls. The Beauty Cuties are the experts on everything beauty - Hair, Makeup or Fashion! Change their stylish look by "growing" or "shortening" their hair and add funky hair extensions for cool looks. You could pose their bodies dressed in edgy fashion outfits. They were also different to other dolls. They had large heads and tiny bodies. They had another feature which was reminiscent of the vintage Pedigree Peepers doll of the 1950's, and the Blythe dolls of circa 1970 - their eyes could change colour by just pushing the top of their head. 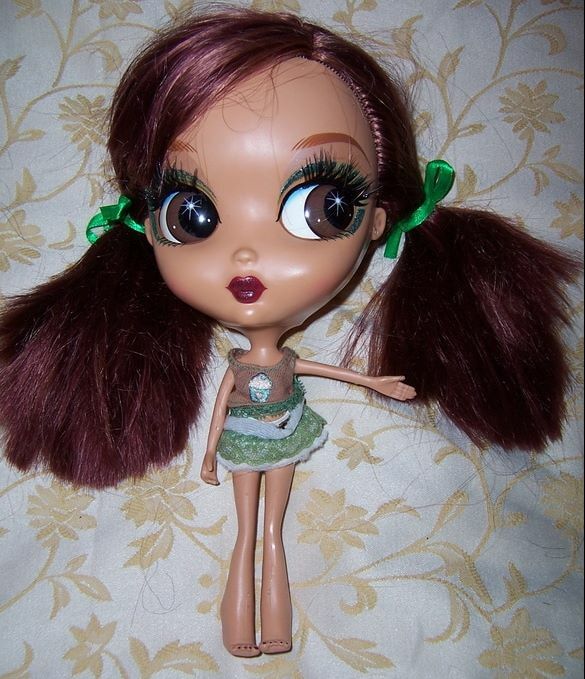 Loveylu is from a range of eye colour changing dolls which were produced in 2006 by Mattel. She has a small jointed body with a large head with large eyes which change colour with a press on the head. Her eyes change colour and go to different directions when you push on the top of her head . Her eyes have magnificent long thick eyelashes. She has rooted red hair with lighter highlights through it. Her hair can be brushed. I think some of the smaller Bratz doll clothes will fit her small body. She is in lovely condition. 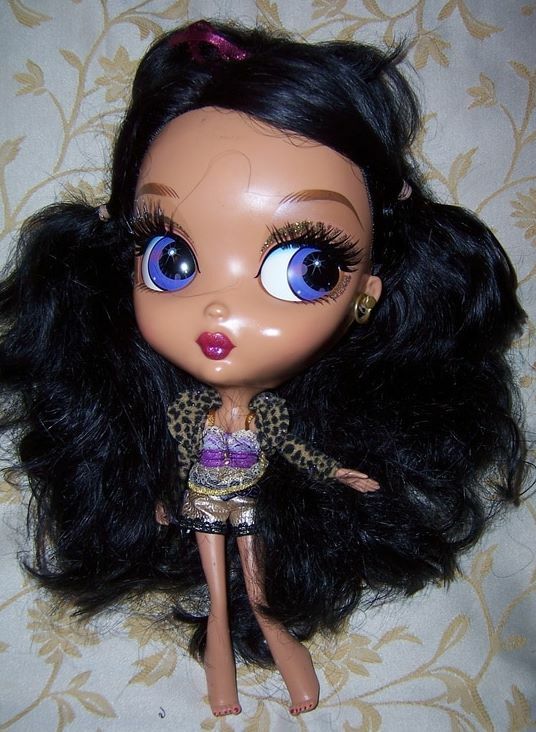 Rockabelle is from a range of dolls which were produced in 2006 by Mattel. She has a large head with large eyes which change colour with a press on the head. Her jointed body is quite small and out of proportion compared to the head. I think some of the smaller Bratz doll clothes will fit her. Her eyes have magnificent large thick eyelashes. She has rooted blonde hair with highlights which can be brushed. Her hair still appears to be in original style, and does not appear to have had any hair cuts. She comes to in her original outfit and original boots on her feet. She is a lovely rare eye colour changing doll. Glamalina is from a range of Mattel Beauty Cutie dolls which were produced in 2006 by Mattel. She has rooted black hair which can be brushed. She comes to in her original outfit with a handbag, and she still has both of her earrings.